China has been hard at work trying to nudge its way into the international auto market . Most taxi fleets aside, it’s more common to see the likes of Ford, Nissan, Volkswagen and Toyota prowling the streets of Beijing and Shanghai than it is to see any Chinese made automobiles. Thus, a team of 19 Chinese designers worked tirelessly over three years to produce something Chinese citizens could really be proud of. The fruits of their labor are…well….the car pretty much speaks for itself. Coincidentally, earlier this year President Xi Jinping rolled out a campaign which generously used the term “The Chinese Dream“. Some assumed it was an effort to rekindle warm-fuzzies from the “Good Ol’ Days”. Some people may have even gone as far to call it propaganda. Conversely, he was just talking about this sweet lookin’ ride. 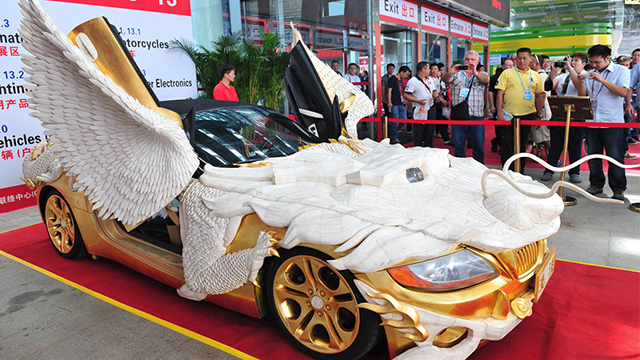 BMW and Mercedes ought to take notice – the “Golden Dragon” is obviously looking for a share of the luxury market.